Over the 2016 spring break, a group of American University students in their first year of the AU Scholars program traveled from Washington, DC, to Havana, Cuba, with two professors. Their trip was focused on researching the environmental problems facing Cuba as it undergoes major changes in its foreign policy. 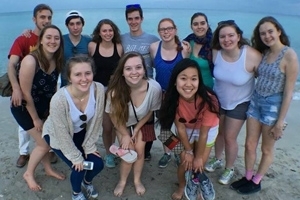 In preparation for the trip, the class spent the spring semester studying social, political, and environmental structures in Cuba and creating research projects focusing on various environmental issues. The class hosted guest speakers from the US Department of State and the university’s School of International Service to gain perspective of Cuba’s current political and environmental standing. The research focused on Cuba’s agricultural practices and the country’s position in the global food trade market. The food produced in Cuba comes from small-scale farms called “organopónicos.” The students visited both urban and rural organopónicos and talked to managers and farmers. Through student-conducted interviews, the group gained firsthand insight into the way that the United States-Cuban embargo has resulted in Cuban farmers exclusively using organic practices—because fertilizers and modern US agricultural technology are not accessible to them. However, as the demand for food increases, and the relations between the two countries improve, these organic methods will most certainly be affected. The group also traveled to several areas of Cuba including the coasts of Varadero, Las Terrazas, and Las Viñales. In each location, students conducted and filmed interviews with Cubans, asking questions related to their specific research projects. Kiho Kim, professor of environmental science, guided the students in the details of their research, while Larry Engel, associate professor in the AU School of Communications, offered expertise in documenting the research through film. The students presented their research projects at the end of the semester at the AU Scholars research symposium. Final projects included documentaries, an eBook, and a series of short films.